Hours and All about Us! Welcome to Trade Roots Fair Trade Gift Store, Coffee, and Wine Bar! Trade Roots Promo from Cody Johnston on Vimeo. So often people come into the store and ask, “What made you open a store like this?” Simple question; not so easy answer….. In short, I was looking for a way to support so many beautiful people, cultures and handicrafts while remaining in what has become my home of 30 years! I moved to Washington, DC after college thinking I’d join the Peace Corps, World Bank or AID. But as often happens in life; well, life just got in the way. Four boys, a few non profit jobs and thousands of APS volunteer hours later, I started thinking about how to get back, in part, to the reason I came to DC to begin with! While visiting a beautiful fair trade store in Warrenton, VA in the summer of 2012 and reading a wonderful book about up-cycling in India, (Behind the Beautiful Forevers, Kathryn Boo) it came to me: I could open a store here that helps support people globally. I believed a fair trade store and coffee shop in Arlington fills a niche in this community. Farmers and artisans in developing countries need a market for their products and NOVA residents might like supporting these endeavors. A win-win! Why fair trade ? 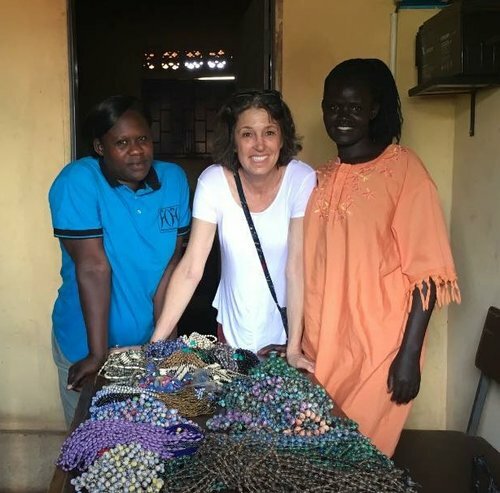 In so many countries around the world, talented craftsmen are recycling aluminum cans, textiles, and telephone wire to make beautiful and original jewelry, scarves, bags, etc. Similarly, small-scale coffee growers produce beans that showcase the rich, one-of-a-kind flavors and notes from their particular farm. In both of these cases, their work reflects their cultural identity and is often so different from what we find here. Fair trade allows hard-working men and women from developing countries, slums, small villages or in places of hardship, tocreate, work and sell their products by taking down many of the barriers to trade. Fair trade respects and appreciates hardworking people, provides a living wage for marginalized populations, supports the conservation of the environment and empowers women and minorities. Thanks for visiting the site. By purchasing fair trade products, you are taking a step toward alleviating poverty in developing communities, allowing many people to escape city slums by allowing them to work from home, and even creating avenues for literacy, banking, and clean water projects. Come by our gift store to see some of the amazing products, or give us a call and we'll personally send a picture and ship for you! On behalf of the thousands of artists from Africa to South America, from Asia to Denver, CO who have products at the store, thank you!